Devolver Digital E3 2017 Press Conference: Spot On But a Tad Too Dark | Nerd Much? If you’re like most gamers on the east coast, you probably called it quits last night after Bethesda’s big night when they announced The Evil Within 2 and Wolfenstein II: The New Colossus for October 2017. 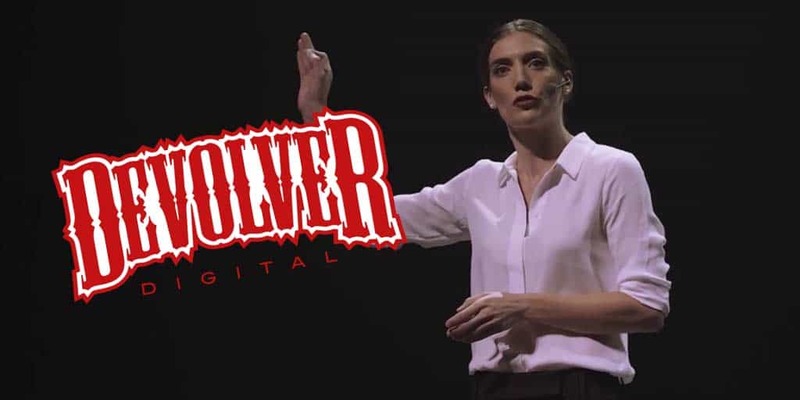 Since the last two press conferences of the day were a bit too late on the east coast — Bethesda at Midnight and Devolver at 1AM ET — you probably didn’t say up for Devolver Digital (you can watch the entire Devolver Digital E3 2017 press conference below). Luckily, you didn’t miss any new game announcements from Devolver, as they didn’t announce anything new. Instead, Devolver made a brave play by having their press conference be a short, 15-minute spoof of E3 press conferences. If you stayed up until 1 AM to watch it, it’s possible that you didn’t find it as funny as it actually was (we get it — you were tired and cranky). But if you watched it this morning after getting the recommended eight hours of sleep, you probably had a chuckle or two. Their fifteen-minute presser featured a woman standing on stage poking fun at the language typically used during big E3 conferences, like over-using the word ‘future’ and proclaiming something as exciting when it really isn’t (like something new you have to pay for). There were two speakers, both of which used grandiose language to oversell their ‘reveals’. Also, it hilariously featured the same audience shots throughout the conference, continually showing the same shots of people laughing and applauding. The majority of the bit was chuckle-worthy at most, but it was enough to get the point across and keep it lighthearted and silly. However, it did take a dark turn at the end with all of the blood and scenes that can only be compared to that one chocolate river scene in Willy Wonka and the Chocolate Factory. But, generally speaking, it was well-done. I should probably also note that Devolver Digital did make the announcement beforehand that there wouldn’t be any new game announcements, so those going in expecting games must’ve just missed the memo. The response to the Devolver Digital E3 2017 press conference seems to be incredibly polarizing. Half of the community seems to have the “I shaved my legs for this” mentality in response, while the rest of us were okay with wasting fifteen minutes of our time for something fresh, unique, and slightly comical. For those who didn’t know, the conference was right in-line with the indie game publisher’s attitude that exudes from its social media accounts and press releases; they have always been this far out there, but now, their strangeness has been presented to a much bigger audience. It was an interesting branding play by Devolver, and we’ll be interested to see the publisher’s response to the community’s reaction.